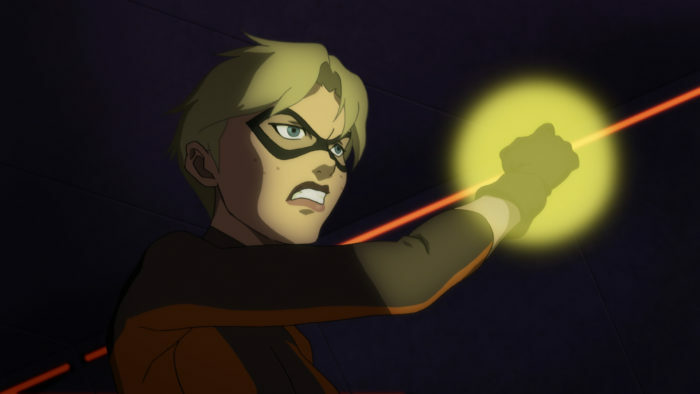 Teen Titans: The Judas Contract Brings The Dark On April 18th - Trailer - Are You Screening? Those who aren’t familiar with anything but the cute Teen Titans series are in for quite a surprise as the heroes return to their darker roots in Teen Titans: The Judas Contract, which is one of the most incredible efforts from the comics. The feature-length film is inspired by a story arc from the 1984 DC comic, and has an incredible voice cast backing the supremely gritty arc. The Blu-Ray Giftset, which includes an exclusive Blue Beetle figurine, will hit on April 18th, with Digital HD release on April 4th. 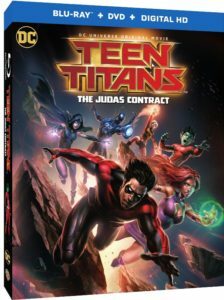 In The Judas Contract, the Titans – Beast Boy, Raven, Blue Beetle, Robin, and Nightwing – are led by Starfire, but their newest teammate, Terra, is throwing the groups dynamic out of whack, and the team comes up against Brother Blood, an ancient evil, and Deathstroke is waiting in the wings to cause problems as well. The “normal” plotline of a comic gets turned around as this story revolves around intrigue and strange twists, with, as usual, a focus on the team’s ability to gel as a team. It makes for an incredible adventure. The Blu-Ray also comes with a couple of great featurettes that are probably worth the price of admission on their own. Check out the trailer and get all the info on the release below. The landmark Teen Titans story will be available on Blu-ray™ Deluxe Giftset ($39.99 SRP), Blu-ray™ Combo Pack ($24.98 SRP) and DVD ($19.98 SRP) starting April 18, 2017. The Blu-rayTM Combo Pack includes the movie in high definition on Blu-ray Disc, a DVD, and a digital version of the movie on Digital HD with UltraViolet*. The Blu-ray™ Deluxe Edition will include all components of the Blu-ray™ Combo Pack, along with an exclusive figurine of Blue Beetle in a numbered, limited edition gift set. Teen Titans: The Judas Contract will be released via Digital HD on April 4, 2017. Christina Ricci (Sleepy Hollow, The Addams Family) and the late Miguel Ferrer (NCIS: Los Angeles, RoboCop, Crossing Jordan) join the already established Teen Titans voice cast as Terra and Deathstroke, respectively. Returning Titans actors include Sean Maher (Firefly/Serenity, Batman: Bad Blood) as Nightwing, Stuart Allan (Batman vs. Robin, Batman: Bad Blood) as Robin/Damian, Taissa Farmiga (American Horror Story) as Raven, Jake T. Austin (Wizards of Waverly Place, The Fosters) as Blue Beetle, Brandon Soo Hoo (Tropic Thunder, From Dusk Til Dawn: The Series) as Beast Boy, and Kari Wahlgren (Phineas and Ferb, Legion of Superheroes) as Starfire. Gregg Henry (Scandal, The Killing, Payback) voices the villainous Brother Blood. The voice cast also includes Maria Canals-Barrera (Wizards of Waverly Place) as Jaime’s mother, Meg Foster (They Live) as Mother Mayhem, Crispin Freeman (Justice League Action, Batman: Arkham games) as Speedy, Masasa Moyo (Young Justice) as Bumblebee, David Zayas (Gotham, Dexter) as Jaime’s father, Jason Spisak (Young Justice) as Kid Flash, and Kevin Smith (Clerks, Geeking Out) as … himself. Produced by Warner Bros. Animation and DC Entertainment, Teen Titans: The Judas Contract is directed by Sam Liu (Batman: The Killing Joke) from a screenplay by Ernie Altbacker (Justice League Dark). Sam Register is Executive Producer; James Tucker (Batman Bad Blood, Batman: Return of the Caped Crusaders) is Supervising Producer; and Alan Burnett (Justice League vs. Teen Titans) is co-Producer. Sneak Peek – Batman and Harley Quinn: Sneak peek at the next DC Universe Original Movie, Batman and Harley Quinn, featuring the talented creators and voice cast. Featurette – Titanic Minds: Wolfman and Perez: This revealing documentary explores a creative partnership that has lasted decades as Marv Wolfman and George Pérez come together to discuss their careers and one of the most famous runs in Teen Titan history, The Judas Contract. Featurette – Villains United—Deathstroke: When the super-soldier Deathstroke appears, the forces of good will be in the fight of their lives. This short featurette reveals the origin and unique abilities of this villain.